Note: This is an additional module and not included with ‘Retailer Solo’. Anyone looking to publish their own website and run their own on-line shop will be aware of the complexities and commitment required to get it up and running, let alone maintain it over time. RBA Retailer can offer you a full and comprehensive solution. We can set you off with your own website, styled from a template similar to that shown below. This would be branded with your own company information, logos and colours etc, and can also process on-line card payments. The product information and content would then be managed by you on an ongoing basis. But not as a secondary operation, the product details are picked from the main stock file and therefore automatically maintained through normal daily operation by the retail store. Hence, an economical and time saving solution to a very sophisticated and professional addition to your business. Product setup, stock, descriptions and images all stored in one place. 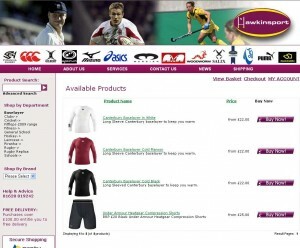 Product images, stock and price information is updated on the web site automatically. Web design and setup all included in the initial setup / integration fee. Sales information can also now be downloaded from the website, allowing all invoicing and accounting to be done within the EPOS application. Point and Click image tools to resize, transpose and import product images, without the need to use any 3rd party imaging software. Low ongoing maintenance / hosting fees.